The Toro Dingo extends your versatility, while improving your productivity when faced with a variety of landscapes and ground conditions. The Toro Dingo is extremely gentle on turf and has plenty of power and is harnessed with only 3 easy-to-use hand controls. These simple controls coupled with walk behind operator position translate into extremely short learning curves, 360 visibility and instant productivity. With our available attachments, there will be no stopping you! 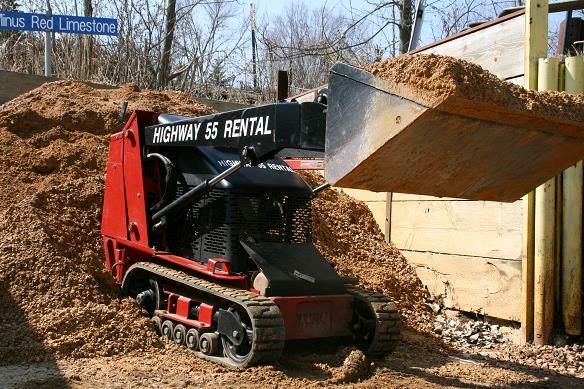 LIFTING CAPACITY WITH BUCKET 500LBS, 20 HP GAS ENGINE 46" DUMP HEIGHT. * Please call us with any questions you may have about our dingo mini loader w/bucket 427 in Hamel MN, Plymouth MN and the Twin Cities.